S. – This film is a firm childhood favourite of mine which, like all good kids entertainment, managed to both scare the living daylights out of me and charm me to the point of obsession with its vibrant colour, movement and soundtrack. As a child I used to wait impatiently for the black-and-white Kansas phase to be over with so that I could revel in the visual delights of Oz, a bit like having to eat all of your vegetables before you were allowed dessert. However, it was not just the lack of colour responsible for my impatience, there is genuine unease in these opening scenes that are more obvious (and less over-whelming) as an adult viewer. First and foremost is the evil Miss Gulch (Margaret Hamilton) who just made my blood run cold. 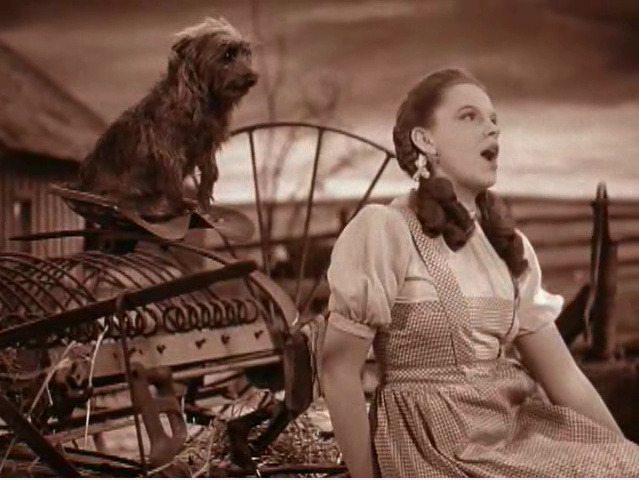 Secondly is the scene where Dorothy (Judy Garland) is caught in the impending tornado, I always hated seeing her kick at the door to the storm cellar but being too late to find refuge. Up until Dorothy gets clunked in the head by the window my heart was always in my mouth. Watching this time around I really enjoyed Hamilton’s villainous spinster and the effect of the tornado closing in on the Gale farm is truly extraordinary. J. – That tornado is insanely cool. It’d had been a long, long time since I’d seen The Wizard of Oz, but unlike you, S., this was never really a favorite of mine when I was a kid (I think I was allergic to musicals). But that said, I still feel like I know every frame and every word of every song, so clearly it left a mark. As kids, the sepia-toned Kansas segment was always the part you had to endure before the fun began, but coming back to The Wizard of Oz now it may very well be the best part of the movie — it certainly has the most iconic song of the film. Also, Toto is awesome. S. – To one of the most memorable scenes in Hollywood cinema ever! A door tentatively opening in a sepia-toned room to unveil the mega-saturated colour blast that is Oz. The reveal is beautifully constructed and is only more special on repeat viewing when you know what lays beyond the drab walls of the battered ole homestead. I still got a thrill seeing the transition as Dorothy becomes her more famous Technicolor self. Watching it this time around though I found that this is the moment where the movie starts to lose its appeal. Those insane Munchkins (with the exception of the Lollipop Guild, who remain awesome) are really irritating and the insipid soap bubble Glinda is pretty useless to a girl who has just found herself in a tricky situation. But given that the story eventually just bails out with the “it was all a dream” clause I guess this is really Dorothy’s fault for having such a whacked-out imagination. The brightness, squeaky voices, repetitive songs, and simple logic of pretty-equals-good and ugly-equals-wicked all combine into the movie equivalent of kiddy crack. But as an adult viewer this whole Oz concept is a bit on the stinky side. J. – That reveal of Oz through the door is still one of the greatest moments in movies, and a neat little trick on the part of the filmmakers — check out the photo above for an explanation of how it was done. But I have to agree that the Oz segments just don’t hold up for an adult audience, particularly the Munchkinland and Glinda bits, which are nauseatingly twee. 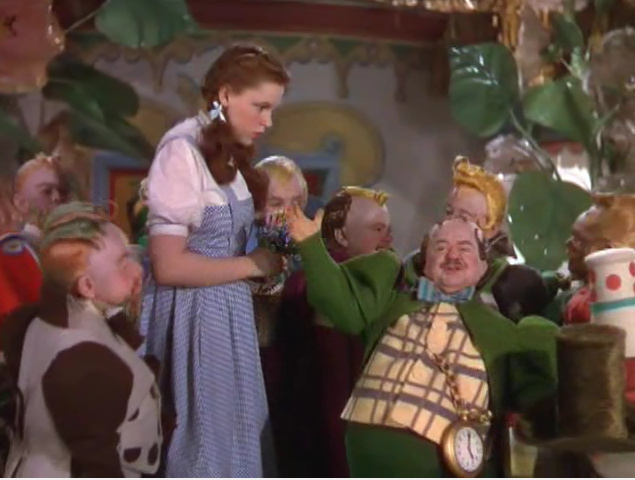 That said, the production design of Oz is generally amazing. I love how they pretty much allow Oz to look as fake and artificial as possible — it’s just a riot of colors and shiny synthetic materials (bakelite maybe?). And there are numerous instances where it is blatantly obvious where the sets end and the matte paintings begin. But it all somehow doesn’t matter, in fact I’d say it actually makes things much better to have everything look and feel so fake, it somehow manages to augment the whimsy and the fantasy rather than spoiling the illusion, which is a paradox indeed. But however poorly the trill-voiced Munchkins fare from the vantage point of the adult viewer (although I’m also a sucker for the Lollipop Guild), the movie does roar to life as soon as Margaret Hamilton bursts back onto the scene as the Wicked Witch of the West. We absolutely need to talk about her performance, S., but I’m thinking it might be best to first tackle Dorothy’s companions, because I know we both weren’t as enchanted with those performances as our younger selves may have been. The Munchkins really don’t hold up nearly as well as we remembered, with their dubbed, trilling voices and whiff of exploitation. But the sets and costumes are remarkable design achievements, setting up a dynamic that generally holds throughout the film — killer style, sub-par performances. S. – A fellowship made up of a scarecrow, a tin man and a lion is such a fabulous idea, I guess we have the book to thank for that brilliant and bizarre combination, with the costume department delivering the magic to breathe them all so memorably into life. I have to say I never realised how camp the Tin Man (Jack Haley) was!! And he walked all that way just to get a shiny new accessory, kind of great! The performances of the adventurous companions are all very over the top and while the shenanigans may be entertaining for the youngsters it makes for fairly tedious viewing if your head ain’t full of stuffing. 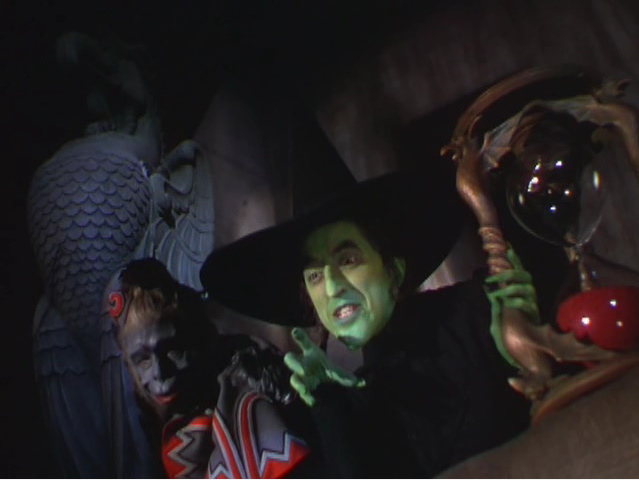 Melodramatic performance is a common feature of the production but it is done with greater success by Hamilton and Frank Morgan who manage to bring some gravitas to their roles (particularly that of the wicked witch, who along with her flying monkeys, became a fixture of my childhood nightmares) as opposed to the bumbling trio of misfits that Dorothy collects on her journey. You mentioned in the intro, J., that The Wizard of Oz did not do well at the box office and I can understand why. Before the era of movies targeted specifically at children I suspect the pantomime feel of the acting was a turn-off for many. Admittedly these gripes carried absolutely no weight with me as a young viewer, the hammy characters were just part of the fun (although I never really warmed to the Lion (Bert Lahr), I think because of the dreadful warbly singing) and I think the subsequent success of the film as a TV favourite is testament to its kid-friendly appeal. While on the topic of performance props have to go to the little dog Toto who, along with Hamilton and Morgan, was amazing throughout. 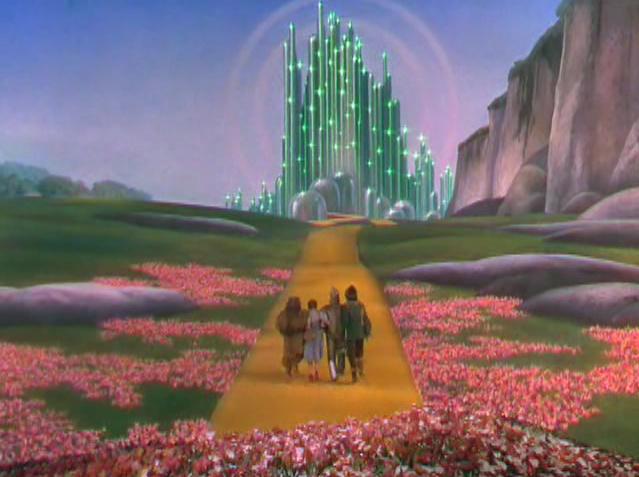 The Emerald City and surroundings, like many things in Oz, just screams, “FAKE!” But that doesn’t matter at all, or rather the apparently deliberate artificiality of Oz becomes one of the films strongest aspects, constantly showcasing the fantasy and whimsy of the story. J. – It is interesting how very much the performances in The Wizard of Oz seem to be in the pantomime tradition, because that’s not really a thing in the US. In fact, most of us Americans assume that pantomime is just a long form of the word mime, when they couldn’t be more different. (I, for instance, didn’t see a panto performance until well into my 20s.) But perhaps things were different in the 1930s, when stage productions would have been more popular. But that said, yeah, I also had a hard time getting into the performances by the Scarecrow (Ray Bolger), Tin Man, and Lion (although I actually like Bert Lahr’s Lion the best of the trio because he is so delightfully weird). I’m also not a fan of Garland’s performance as Dorothy. To be fair, the girl could sing, and though it has been done to death, her version of “Somewhere Over the Rainbow” is still rather marvelous. But Garland gives every line a reading pitched somewhere between vigorous complaining and asking a question — there’s a volume and insistent quality that steamrolls over all subtlety and emotion. What’s amazing about Hamilton and Morgan is that their excellent performances still feel of a piece with what the other actors are doing. They also utilize an over-the-top delivery, but each have the presence and skill to make it work like gangbusters. That’s particularly true of Margaret Hamilton, who really makes that role her own, twisting and grinding every bit of cackling villainy from her body — her hands alone are an evil character all to themselves. And 75 years on, if you say “witch”, she’s probably still the first thing to pop into the heads of millions. I think that’s particularly remarkable because, watching the film again, I couldn’t help but notice that the witch really does very little to threaten the heroes for most of the film (I mean, they make it to the Emerald City pretty much unmolested), yet she remains a credible menace despite very little screen time. That’s acting that leaves an impression! Margaret Hamilton gives the performance of the film as the Wicked Witch of the West, an iconic role if ever there was one. Of course, it never hurts to have an army of flying monkeys to back up your acting. S. – The moral of the story is a rather confused aspect of The Wizard of Oz. I remembered it as being a message to be grateful for your family but viewing it with a more critical (and perhaps cynical) eye, mixed messages abound. To begin with as soon as we progress beyond the introductory dance routines for each of the Scarecrow, the Tin Man and the Lion it is quite obvious that the qualities that each of these characters claim to lack is not their problem. All they really needed was a goal, yet this is not the message of the film. It does (very rightly) get pointed out to each of the main players that they already have what they are looking for, yet the trinkets bestowed by the not so great and powerful Oz still appear to be the real prize. For me it is the moralising aspect at the end of the Wizard of Oz that is its main weakness. While the adventure narrative offered examples of the value in friendship, facing your fears, discovering new places and standing up for yourself, all that is at odds with the take home message that true happiness lies where everything is comfortable and familiar and you should not go in search of more (shudder…). 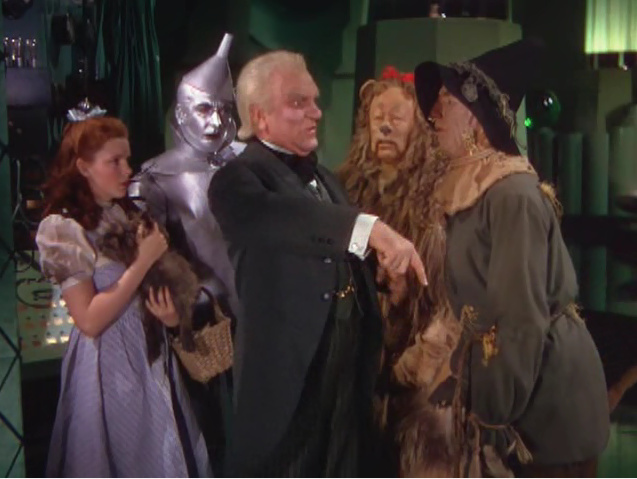 Frank Morgan is great as the titular wizard (and four other roles), but the scene where he hands out symbolic trophies to the Scarecrow, Tin Man, and Lion seems to be a wobbly one in terms of establishing the moral of the story. For instance, was it intentional that the Scarecrow gets the Pythagorean theorum wrong? J. – Dorothy lays out the moral of the story herself in the following bit of dialogue, “If I ever go looking for my heart’s desire again, I won’t look any further than my own back yard. Because if it isn’t there, I never really lost it to begin with.” I’m not sure that second sentence actually makes any sense, but I get what they’re going for — and what they’re going for is revolting. I loathe, loathe, loathe the take-home message of The Wizard of Oz — it runs counter to everything that growing up is supposed to be and must be one of the worst endings of any children’s film. That someone can feel sharply constrained in their home life but then have a fabulous adventure and make new friends only to want to abandon all that they have earned and achieved for a slice of dirt in Kansas is ludicrous. Admittedly, I’m saying this as an expatriate living pretty much as far away from where I grew up as is humanly possible (absolutely no reflection on my family, I assure you), but that’s because I firmly believe in the need to experience new things and different perspectives if you want to be a well rounded, thoughtful person. Perhaps the film was meant as something of a paean to American nonintervention on the eve of the Second World War, but whatever the motivation, I think it gives the worst possible lesson to children. It’s a big crazy world out there, and if you hide away at home you’re going to miss out on the most interesting parts of life — Dorothy’s a dope. So, there’s definitely things to admire about The Wizard of Oz — particularly the inventive set designs and songs that absolutely positively will not leave me alone (seriously, it’s becoming a problem). But I think it falls flat for the adult viewer in many ways — and the moral isn’t appropriate for any age. 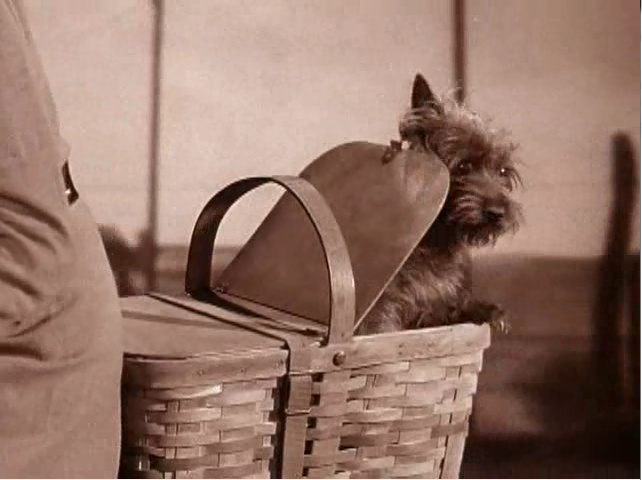 And since I’m apparently in a cynical mood, I’ll finish with a grim plot-thread the filmmakers left unresolved: Isn’t Toto still going to be put down? See, told you the ending was terrible.